We’ve had a lot of requests for makeups created with ready made kits. So here’s one with a classic Zipper Face, made from a basic cheapo kit. While we were at it we also decided to create an additional version with the zipper as a choker for that stylish beauty look. As for the concept of zipper face makeups they are pretty much splitting the Internet in two. You either hate them and think they are cheesy, or you love them and create them yourself. There is a saying going around as well, that you are not a true sfx makeup artist until you have create a zipper face makeup. You should be able to find a zipper face makeup kit in any party store or well sorted department store. It’s almost as basic as milk, at least around Halloween. You can also buy just a zipper, some skin adhesive and a little red colour and you’re good to go. Add a little fake blood too and your zipper face look will be a complete success. Are you able to use the zipper more than once?? 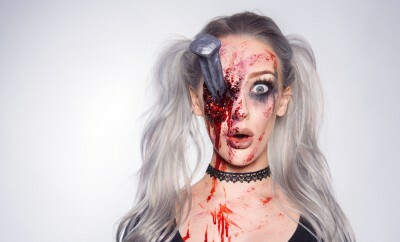 i really want to do something goary for the up coming halloween and i have been watching her videos and i have many things to think about doing like this if you have the same problem. I can watch elli do make up and listen to macs voice forever. Elli is so creative and macs voice is SO relaxing! ellimacs sfx makeup is my favorite channel for makeuping. Hey dude can you zip me up? Awesome vid - so much simpler than I thought it would be. Can anyone recommend where to find skin tape in the US? Oh my god! I was foing to buy this exact kit and watched yt to see a tutorial and I saw this! Thank you so much!! This looks so cool!! I'm so glad you guys did a video like this! Hi, can you please let me know what brand of skin tape you used? omg.. so quick and easy but looks very stunning! That intro tho?! hahahahaha lol Amazing!!!! Whats de voyce of the intro? Is it an app? you should do the demagorgon from stranger things!! I got a kit with the exact same stuff inside from a pound store in Glasgow. I bought 2 purely for the spirit gum! "Oh my god we don't have an intro for this one"
Hi ellimacs, Could you do a wolf attack makeup tutorial, My little red riding hood costume theme consist of a wolf attack, but I can't find any good video tutorials. I love all of your videos and looks! great job!